(CNN) -- In the wake of the wildly successful Spirit and Opportunity rover missions, you would think NASA would approach the landing of the next Martian probe with high confidence. 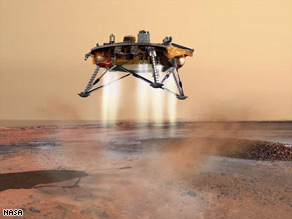 An artist's rendering of the landing of the Phoenix Mars Lander. But the truth is sometimes not what you would think. "I do not feel confident. But in my heart I'm an optimist, and I think this is going to be a very successful mission," said principal investigator Peter Smith, an optical scientist with the University of Arizona. "The thrill of victory is so much more exciting than the agony of defeat." Indeed, the truth is that the planetary scientists and engineers who make up the Mars Phoenix Lander team will be biting their nails Sunday evening as they cluster around computer monitors in mission control at the Jet Propulsion Laboratory in Pasadena, California. That's when their spacecraft, which launched to Mars in August, will finally arrive on the Red Planet. But first, they have to get the lander on the ground, and that's where the worry comes in. In fact, they have a name for it in the Mars exploration community: "seven minutes of terror." Seven minutes is all it takes for a spacecraft travelling neary 13,000 miles per hour to hit the Martian atmosphere, slam on the brakes and reach the ground. During that time, onboard computers will be working at a manic pace as the spacecraft deploys its parachute, jettisons its heat shield, extends its three legs, releases the parachute and finally fires its thrusters to bring it down for a soft landing. Hopefully. "Everything has to go right," NASA Associate Administrator Ed Weiler said. "You can't afford any failures." From an overall design standpoint, it is twin to the Mars Polar Lander spacecraft and was supposed to travel to Mars in 2001 as the Mars Surveyor spacecraft. They were part of the "better, faster, cheaper" program, formulated by then-NASA Administrator Dan Goldin to beef up planetary exploration on a lean budget. Mars Polar Lander malfunctioned during its entry and descent into Mars' atmosphere in 1999 and crashed. Technical investigations concluded that as many as a dozen design flaws or malfunctions doomed the spacecraft. The failure of that mission, as well as another spacecraft called the Mars Climate Orbiter the same year, led to some soul searching at NASA. The agency put future missions on hold to rethink the "better, faster, cheaper" approach. And Mars Surveyor went to the warehouse. "The trouble is somebody forgot the 'better' part," Weiler said. "By pushing the 'faster' and 'cheaper' part so hard, engineers were forced to make decisions that weren't necessarily the best and right decisions. And that led to both the failures of the Mars Climate Orbiter and ultimately the Mars Polar Lander and eventually the entire Mars program." But all was not lost. In 2003, Peter Smith proposed a plan to re-engineer that mothballed spacecraft and fly it on a mission to look for signatures of life in the ice and dirt of Mars far North. Mars Phoenix rose from the ashes of Surveyor. Engineers set to work, testing and re-testing the onboard system to ferret out and fix all the flaws they could find. But even the lead engineer admits that he worries they might have missed something. "We always have to be scared to death," project manager Barry Goldstein said. "The minute we lose fear is the minute that we stop looking for the next problem." Another aspect of the Phoenix landing that has the team worried is the landing system itself. NASA has not successfully landed a probe on Mars using landing legs and stabilizing thrusters since the Viking missions in the late 1970's. The other three successful Mars landings -- Pathfinder in 1997 and the Spirit and Opportunity rovers in 2004 -- used massive airbags that inflated around the landing craft just before landing to cushion the impact. "I love airbags," Weiler said. "We got three success stories with airbags, but you don't invent science by continuing to do what you know how to do." Engineers did not use airbags on Phoenix because the lander is simply too big and heavy for them to work properly. And NASA will have to figure out how to land reliably with thrusters and landing legs in order to fly even larger spacecraft in the future. "We landed on Mars with rockets and legs twice with Viking. It's not impossible by definition; we have proof of it," Weiler said. "Humans will have to land on landing legs. Eventually, we want to send humans there, obviously." Assuming the landing is successful, the researchers will quickly begin science operations. The Phoenix landing site is targeted for the far Northern plains of the Mars, near the northern polar ice cap. Data from the Mars Odyssey spacecraft indicate large quantities of ice in the area, probably in the form of permafrost, either on the surface or just barely underground. Phoenix is equipped with a robotic arm that can dig down and scoop up some of that ice and dirt, to look for organic chemical evidence that life once existed there, or even still exists now. "We are not going to be able to answer the final question of 'is there life on Mars?' " Smith said. "We will take the next important step. We'll find out if there's organic material associated with this ice in the polar regions. Ice is a preserver, and if there ever were organics on Mars and they got into that ice, they will still be there today." Indeed, "follow the water" has become the unifying theme of NASA's Mars exploration strategy. In 2004, the rover Opportunity found evidence that a salty sea once lapped the shores of an area near Mars' equator called Meridiani Planum. Astrobiologists, scientists who study life on other planets, generally agree that wet places are the best places to look for life. "There is no life on Earth where there isn't water," Weiler said. "However, where there's water, you find life, especially if you have organics, organic material and energy." Whether Phoenix will find smoking gun evidence of life on Mars is impossible to predict. But Peter Smith thinks success is within reach. "Well, my gut tells me that life is common in the universe and probably somewhere on Mars, there is organic material and perhaps even living material. "Whether it's in the northern plains, I have no idea. But the universe is an immense place. In our Milky Way, we find hundreds of planets, and those are just in the nearby stars. So there must be huge astronomical numbers of planets in the universe." "I suspect not," Smith said.